An Autonomous Underwater Vehicle (AUV) operating closer to a larger vessel experiences significant hydrodynamic forces requiring an adaptive control mechanism to maintain acceptable trajectory. It is therefore important that the designer understands the hydrodynamic characteristics of the vehicle in this scenario in order to develop appropriate control algorithms to deal with its dynamic behaviour. This requires developing simulations of the vehicles behaviour close to the larger vessel, the control algorithms, and the dynamic interface between the two. This paper presents a method to generate a complete hydrodynamic model of underwater vehicles using the Computational Fluid Dynamics (CFD) code ANSYS CFX, which can then be interfaced with the vehicles control algorithms within a simulation environment. The essential aspect of the method is the re-mesh approach, where the mesh deforms locally around the bodies using an Arbitrary Lagrangian-Eulerian form of the governing fluid equations and re-meshes when the deformation significantly compromises the quality of the mesh. This overcomes the motion limitations imposed by a pure deforming mesh approach. Preliminary work to validate the method is based on two smooth spheres moving relative to each other. It shows that this method is able to adequately simulate the fluid behaviour around the bodies. 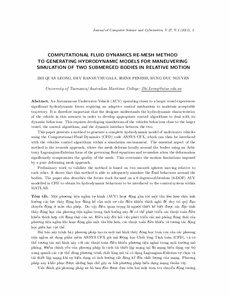 The paper also describes the future work focused on a 6 degrees-of-freedom (6-DOF) AUV modelled in CFD to obtain its hydrodynamic behaviour to be interfaced to the control system within MATLAB.